Get a first look at a trailer for the acclaimed Colombian thriller Monos, which played at both the Sundance and Berlin Film Festivals to excellent reviews from critics all over. Monos is made by filmmaker Alejandro Landes, born in Brazil to Colombian & Ecuadorian parents, he infuses much of the social-political elements of those areas into the film. Monos is one of those beautifully strange, abstract films where this isn't any real explanation given, but you're compelled to follow along anyway. On a faraway mountaintop, eight kids with guns watch over a hostage and a conscripted cow. Starring Moisés Arias, Julianne Nicholson, Sofía Buenaventura, Karen Quintero, Laura Castrillón, Deiby Rueda, Julián Giraldo, Paul Cubides, and Sneider Castro. It's one of the best I've seen out of the festivals this year, one of my favorites as well. Patagrande, Rambo, Leidi, Sueca, Pitufo, Lobo, Perro and Bum Bum. 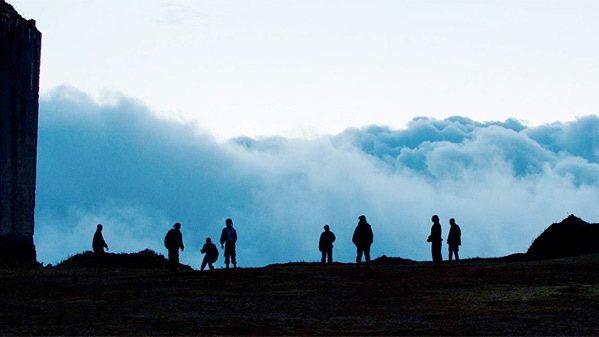 Eight stray teenagers, each bearing a code name, form a paramilitary squad on a remote hilltop. They are instinctively drawn towards hedonism and ferocity. A messenger delivers instructions from the Organisation: they are to look after a dairy cow called Shakira and an abducted woman from the USA known as Doctora. But their carefree time comes to an end when death pays them a visit and their position is compromised, forcing them to relocate deeper into the jungle. Monos is directed by Colombian-Ecuadorian filmmaker named Alejandro Landes, director of the film Porfirio previously, and the documentary Cocalero. The screenplay is written by Alejandro Landes & Alexis Dos Santos, from a story by Alejandro Landes. It premiered at the Sundance Film Festival earlier this year, and also just stopped by the Berlin Film Festival (read our review). Neon will release the film, but it's still waiting for a release date to be set in the US. First impression? Looking good?